Alexei Navalny is a man on a mission: He wants to fight Russia’s egregious culture of corruption with hard facts and the law. If Muscovites had been able to elect their mayor, they would have chosen Alexei Navalny. After Yury Luzhkov was fired, Navalny received 45 percent of the vote in an online survey. In the midst of Russia’s gloomy political culture and entrenched bureaucratic corruption, Navalny has emerged as a trustworthy public figure. At 34, he is young, bright and active. He is part of an open crusade against the political system, and LiveJournal is his platform: 25,285 people subscribe to his blog (navalny.livejournal.com). A lawyer by training, in 2008, Navalny used the stock market to pursue a new type of activism: He bought shares in large, state-owned companies, such as Transneft, Rosneft, Gazprom Neft, Sberbank and VTB, then claimed under his shareholder rights access to the companies’ management information, which is all too often opaque. Navalny spends a lot of time verifying information he receives before making it public. “A lot of people come to me with damaging evidence, I verify its authenticity, and I take action. I don’t have the time to worry about who benefits from the crime. If I have documentary evidence that there has been theft, I file a complaint,” he said. Although Navalny is taking risks by publicizing this kind of information, he presses on with the confidence that comes from doing the right thing. 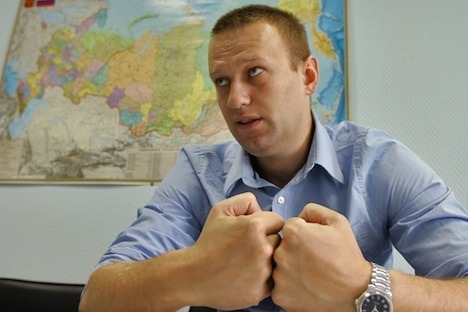 Recently, Navalny gave an interview about his activism to the Russian magazine Afisha. Afisha: Why did you decide to start being so unrestrained in your activism? Alexei Navalny: These people are stealing our children’s future. The ubiquitous state corruption has deprived the country of its future. Everyone, from high-ranking members of the administration to mayors and governors, has a carte-blanche to pillage the state coffers. And in exchange, they are completely loyal to the authorities. What you get in the end is an enormous gap between the rich and poor, which is why Russia remains a poor country, but ranks third in the world in number of billionaires. A: How does defending minority shareholders advance the public’s rights? A.N. : I use a simple legal tool. As a minority shareholder in these companies, I have the opportunity to defend my interests. In Russia, you don’t have the right to stand up for a certain group, but only for your own interests. In effect, the state is the majority shareholder, which thus makes every Russian a part owner. A: What action do you want to be taken? A.N. : Based on what happened with Transneft, I want to see new rules of transparency and control put in place on all major state projects—for example, the Sochi Olympics, North and South Stream construction. A.: Do you believe that having a corruption-free Russia is possible? A.N. : Yes, and it isn’t naïve to believe so. All of these stories of how corruption is deeply rooted in our culture are complete malarkey. I don’t believe that Russia is a lost cause. Our telecommunications companies, for example, where corruption is one-tenth that of Gazprom, are listed on the NYSE (New York Stock Exchange). If Beeline (Vimpelcom) can run a clean business, there is no reason Transneft cannot. A.N. : On the contrary, I have a lot of support because I propose concrete solutions. There are thousands of people who write that everything has been ransacked both left and right. But nobody does anything about. I, on the other hand, do something about it. I am sure that 3,000 people supported my complaint against Transneft. What's more, you cannot act anonymously; you must be ready to take a risk to be on my side. A: Isn’t it frustrating to spend your time complaining? A.N. : I take my indignation and transform it into concrete action. I am not content to cry "thieves"! I called them out, posted their photos and filed a complaint with the police. I will go to court and try to involve foreign stakeholders, among other things.